The price of oil is going to look like saw teeth for some time to come. For purposes of simplicity I will stick to using Brent, the benchmark price for the rest of the world. As I have opined before, if the US lifts the ban on export of our oil, WTI price will rise to Brent levels. These two benchmarks were in lock step for years and then began diverging in 2011 when shale oil seriously hit the market. While on the face of it simply a correlative point, I believe it is causal. When condensate exports began being allowed in 2014 the spread narrowed. I believe that when exports are permitted the spread will disappear altogether. 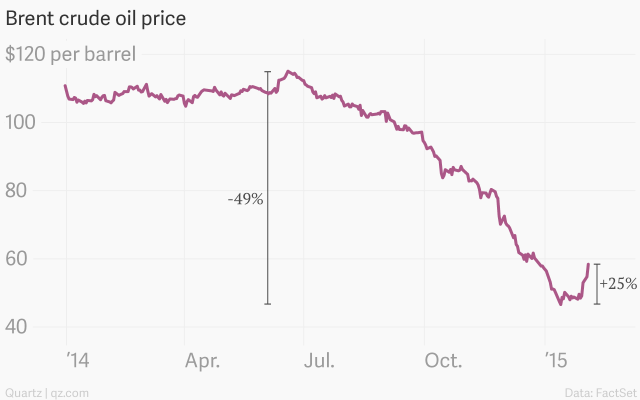 The graph shows Brent pricing up to late February 2015. Of interest is the fact that while the original drop was massive, nearly halving the price, the recent excursion is 25% off a new floor. True demand alteration is hardly ever that sudden. This is likely a result of real or perceived change in supply. Around that time Libya, which had fairly suddenly come on stream with 700,000 barrels per day (bpd) in late 2014, dropped to 200,000 bpd following sabotage and ISIS sourced violence. On a go forward basis, the reason for price excursions will be real changes in shale oil production together with speculative beliefs in this regard. I have asserted in previous posts that the US has unwittingly become the swing producer, meaning when it sneezes world oil catches a cold. The Saudis used to have this status together with OPEC determinism of oil supply. Recently Boone Pickens shared a stage with former EPA head Carol Browner and ex-secretary of energy, Steve Chu, discussing the environmental safety of shale oil and gas production; no doubt the debate was entertaining. Associated with this occasion Pickens stated to the press that the US was responsible for the oil price crash, not the Saudis. While this is not exactly news to at least readers of my posts, I cannot recollect a causal link being suggested by any person vested with expertise. Most of the press has been on why the Saudis did it, rather than whether they did it. Damaging US shale oil production and hurting the economy of Iran and weakening Syria’s Assad (the latter through impoverishing financier Russia) were the principal theories advanced. Assuming the validity of Pickens’ assertion, one can conclude that if US production brought the price of oil down, then reduction in the same would send it back up. One theory of Saudi motivation would be supported. Were the US production in question from conventional resources such as offshore development, one would not expect discontinuities. Conventional production has long latencies: many years to get going and it is not economically viable to turn off and on. Shale oil on the contrary is relatively easy in this regard. Producing wells can be “shut in” with relative ease, especially gas wells. Since these wells tend to decline rapidly in production, mere maintenance of rates in any given area requires drilling new ones. Simply not drilling new wells will have the net effect of reducing US production, which will in turn result in a rise in the price of oil. When the price is high enough they will begin drilling again. A new well can go on stream as soon as ten days after commencement. That period is even shorter for the over 3000 wells that reportedly are in “fracklog” bucket. This is a backlog of wells which have been completed all but for the final fracture stimulation step. Speculators are aware of this. They will drive price up when storage levels drop and the price has achieved a bottom of sorts. This cycle of price increase, new production then depressing the price, followed by reduction in drilling and production will repeat. The visual effect on a graph such as the one above is that of a saw tooth pattern. Predicting the price of oil at any time is an exercise in futility. But my best guess at this time, based on continued weakness in China’s GDP growth, is that Brent pricing will fluctuate in the range $45 to $60 in the saw tooth pattern mentioned above. Whether OPEC can or will intercede in any way to affect this is not known. But it is unlikely that they will curtail production to raise prices. All that will achieve is more US shale oil production. I think the saw teeth are here for a while. You are currently reading SAW TEETH at Research Triangle Energy Consortium.